Christmas and Summer might be the two big dates in the holiday calendar, but Easter breaks can be the perfect time to take advantage of an end-of-season run on the pistes. And whether you're a bargain hunter or a luxury lodger, there are four simple routes to the slopes this year. It may not be spring just yet, but having a clearout of your home can be a great way to avoid tortuous routes to saving money. Collect together your unwanted Christmas presents, old CDs and DVDs, electrical items and even good quality clothes, and hit the web to find a place to sell them. eBay and Amazon Marketplace are the obvious first choices, but websites like Music Magpie, We Buy Books and Zapper all offer cash for unwanted goods, and even pay your postage: cutting out the biggest cost of online auctions. Easter falls exceptionally late this year (the 20th of April), and schools don't break up until the 4th. With the weather remaining unpredictable, it makes sense to hang in there and look out for last minute bargains. 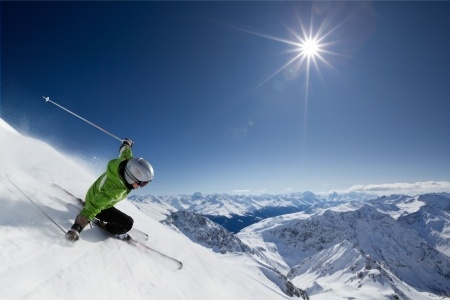 Websites like Ski Solutions, TravelZoo and LastMinute.com offer a range of deals from the affordable to the elaborate. If you want to make the most of a last minute deal but you're not sure how to finance it, our free Money Dashboard budgeting software can help you to balance the books. Our intelligent software automatically tags your expenses and identifies areas where you can save in the short term, or recoup the money you splurge over a longer period. Self-driving is a good way to cut skiing costs. But if you consider resorts in the UK, you'll save even more on flights and petrol  making that skiing holiday both physically and financially easier to achieve. If the weather is kind, UK resorts like the Cairngorms in Aviemore, Scotland are a great low-cost option. The Ski Club of Great Britain offers a handy map of the very best UK resorts, so find out where suits you best, check the weather, and hunt down a deal. Of course, if the weather's too warm, there are indoor slopes in various areas, including The Snow Centre in Hemel Hempstead, XScape in Milton Keynes, Braehead and Yorkshire, plus plenty of dry slopes across the UK. It might not have the glitz and glamour of San Moritz, but you'll get your adrenaline fix and have enough cash left over to splash out next year. You can even use our budget planner to keep track of exactly how much you save. If skiing in the UK isn't your thing, then there's money to be saved in entrusting your trip to one travel company. The rise of self-organised trips has squeezed the humble package company, with the result being that you can now often find deals that bundle your flights, hotel and ski pass together for a much lower price. If you take this route, remember not to dismiss partner deals as mere spam. Sometimes you really can rent equipment or hire a car cheaper by reading special offers from your booking company. Just make sure to judge objectively, not instinctively, and to keep a clear record of all your potential spends.